Sometimes I see evidence that not all dogs and cats brought into the photographer’s studio for a family portrait were happy about the prospect. 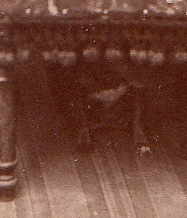 The most common hint is an iron grip; look closely and you’ll see the sitter’s hands are holding the animal tightly or using the collar to restrain it. Sometimes the pet is out of focus from wiggling. I have even seen images where someone is hiding behind the chair, reaching a hand around to hold a dog still. But this little carte-des-visite shows something I have never seen before. 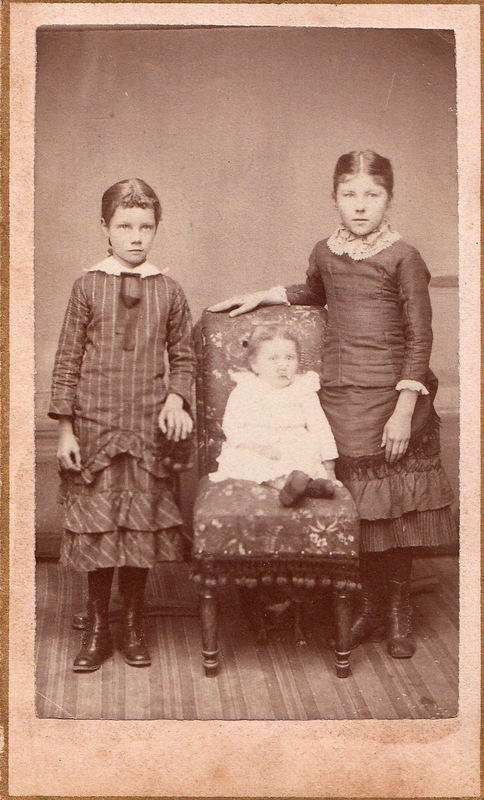 Dating from the late 1870s or 1880s, the photograph by Will W. Hall of Northwood, Iowa, depicts a family of three little girls — and a small dog sitting under the chair. I’ve provided a detail so that you can see him. I surmise that he thought the entire process was for the birds and took refuge under the long fringe of the chair’s slipcover.